Our housekeeper MIRA is by far the best, most efficient, most thorough cleaning person we have ever, ever had!! Mira is not only extremely punctual and never was – not once – absent, she’s always super honest, and so sweet and pleasant! Mira worked very, very hard and her jobs were always finished to perfection. She is a wonderful person and we will miss her very, very much. I loved the way she was with our pets. She really loved them and was always very caring to them. Mira especially loved our little kitty Peggy, whom Mira nicknamed Mickey Mouse – and Mickey Mouse loved Mira too!! Loey and I know that we will never have anybody as wonderful as Mira. You see, Mira not only was a fantastic housekeeper, she became our friend and we loved her! I also want to say that Maria and Beata were always very nice and accommodating to our needs, moving Mira to other days if we were having a party or out of town guests. Your cleaning service is something we always dreamed about having, but we never thought we’d ever fmd one. Well we did, and now we are moving, and one of our biggest regrets is that we are losing Mira. If we could, we would take her with us! Thanks again for giving us Mira and such a people-friendly cleaning service! that we have experienced for these many years. From simple housecleaning to party assistance, there has never been a time when we have not been completely satisfied with the staff or service that you have given us. We recommend you to friends and business associates whenever possible and have heard repeatedly how positive these referrals have been. We look forward to many, many more years of association with you and your staff. Our best to you in the New Year. Thank you very much for such wonderful and quality cleaning services. 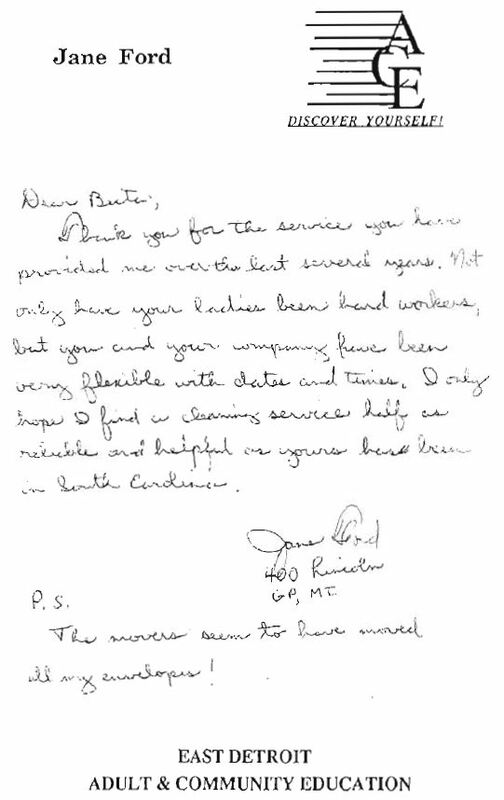 We have appreciated your employees and their work and regret to end the service. Due to our move we will no longer be needing the cleaning services. 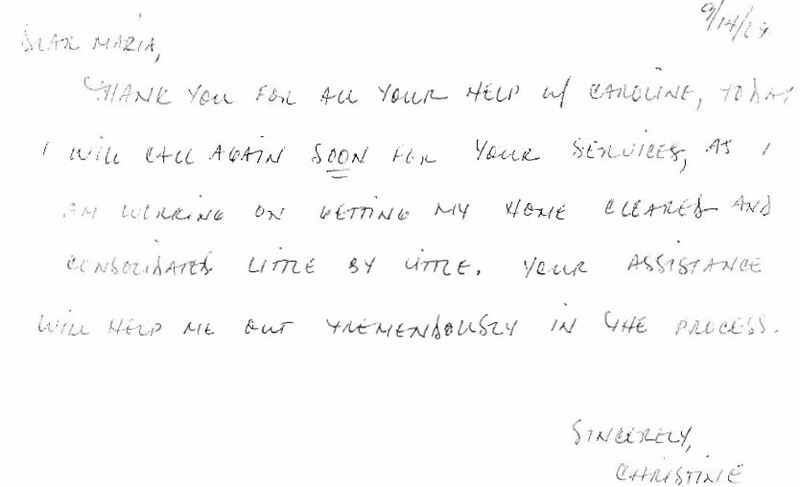 Thank you again for providing such c great service, we will certainly recommend you to anytime we can. Today is the last day we could use your services and we will no longer be needing your company’s services. Jim and I want to take this opportunity to thank you for the many years of dedicated service you offered my mother, which allowed her to stay in her home after her unfortunate fall in November, 2000. 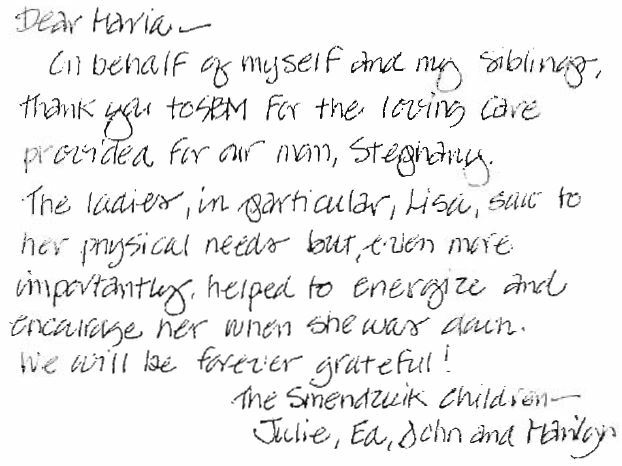 For 6 Y, years you offered her the opportunity to live in familiar surroundings with the dignity and care that we all hope for when caring for our loved ones. 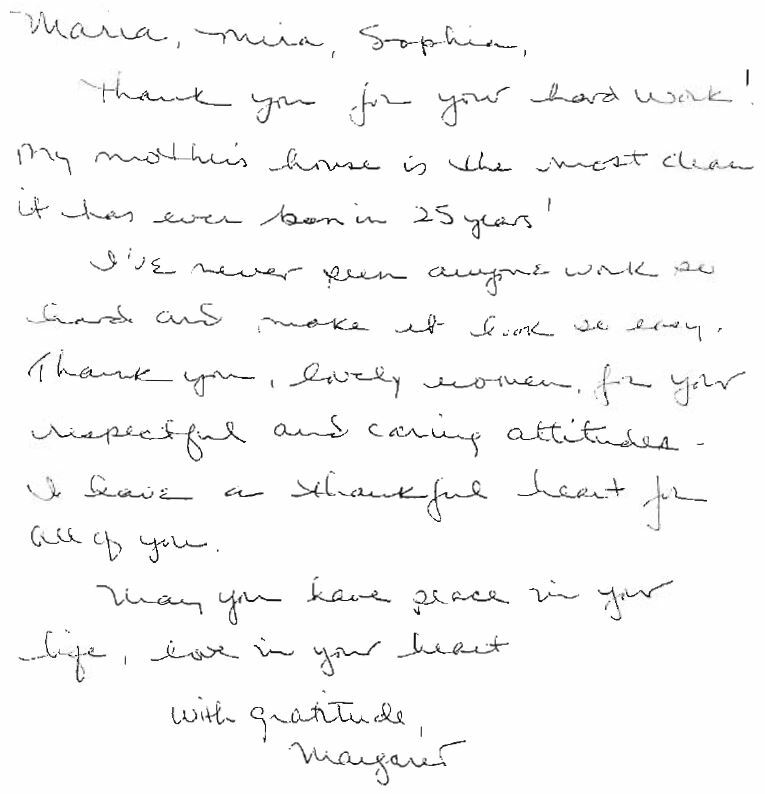 Given our unique issues and concerns, you were always very responsive to our needs, recognizing that first and foremost, the health and care of Carolyn Steyer was your first priority. 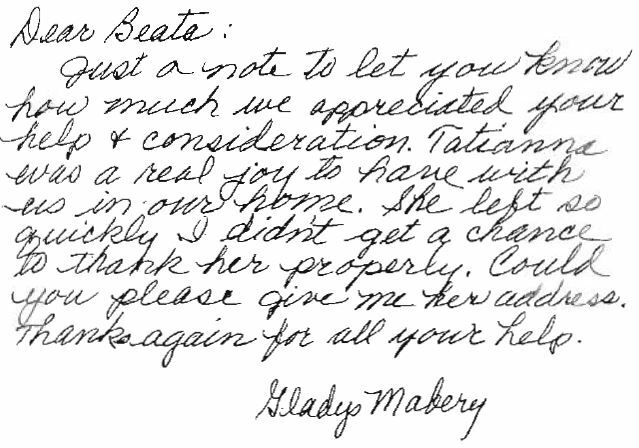 Over the years, as the need to change personnel occurred, you made sure tbat mom’s care was never compromised. You insured, through the interview process, that a match between care provider and care recipient was always maintained. When financial and other issues arose, you worked with the family and showed compassion. 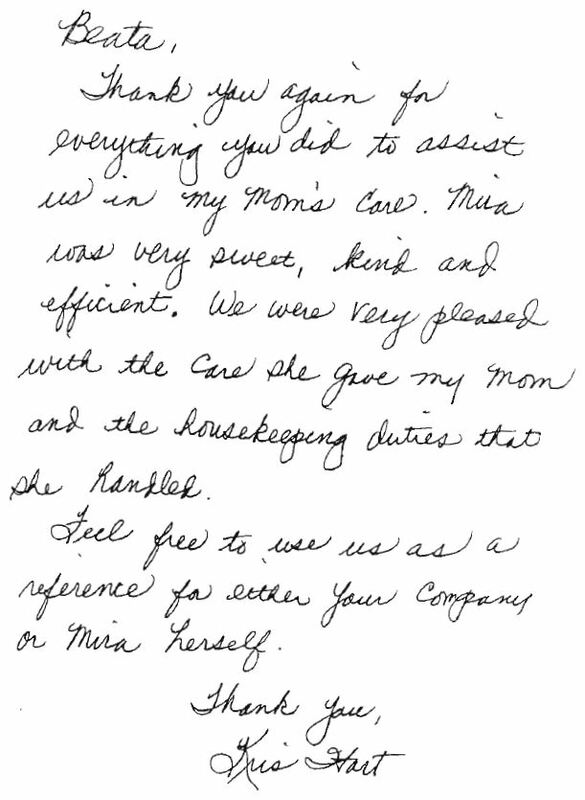 I can honestly say that over those many years, mom was never without the quality care your agency provides. As a member of the “sandwich generation”, I have learned first hand the stresses that come with caring for an aging loved one. 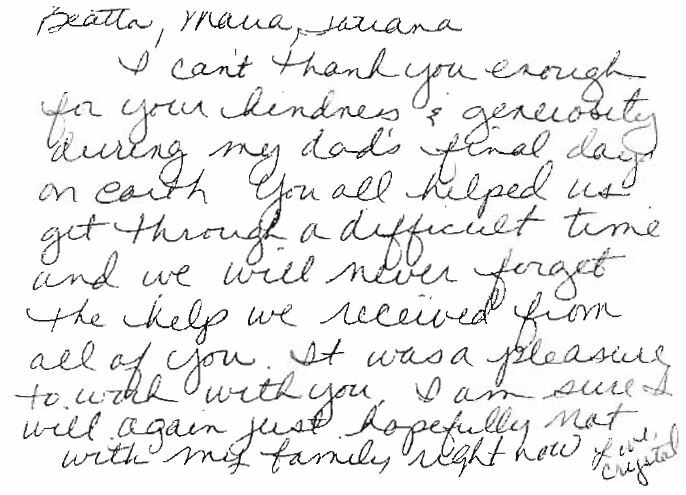 You offer a valuable service 10 the care recipient as well as their family members. I encourage you to offer OUf names as a reference should the need arise. Again, thank you and your staff for the support you have provided our family over these many years. Professional, personable and polite. We have entrusted them for over a decade without complaint. They cleaned my mother house, my son and mine. I referred them to my family, friends and coworkers. 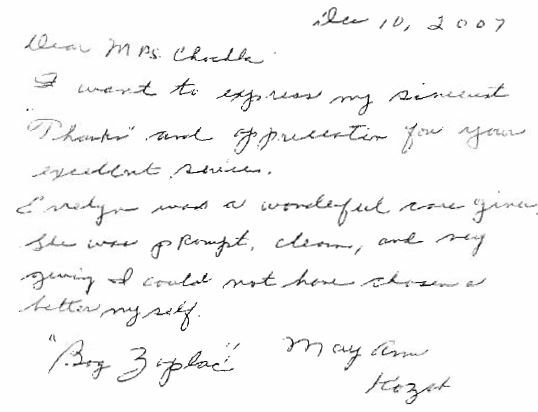 The Best experience we have ever had by anyone servicing our home since we moved to Grosse Pointe area in 1989.